The Center for Creative Leadership (CCL) is one of the top firms worldwide in the field of executive leadership. One of CCL’s core programs is the Leadership Development Program (LDP), a week-long retreat aimed at boosting leadership skills for executives. Prior to the retreat, each participant has their superiors, peers, and subordinates complete a 360 assessment of their abilities. At the retreat, they work with CCL’s trainers and coaches to identify their own strengths and weaknesses and chart a path for improvement. 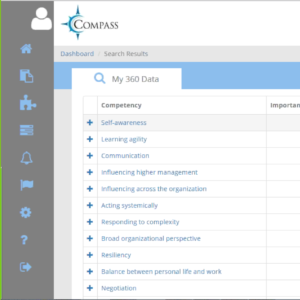 Compass is a web application built by CCL to help participants make sense of their 360 data, set goals that align with their organization’s priorities, and access CCL’s curriculum for improving their core competencies. However, when tested with users, the app caused confusion and was not intuitive. Trainers were resistant to adopt the application and the project was in danger of losing support from key internal stakeholders. A bad experience here would undo much of the hard work CCL had done to position itself as a leader not only in executive education, but in technology. 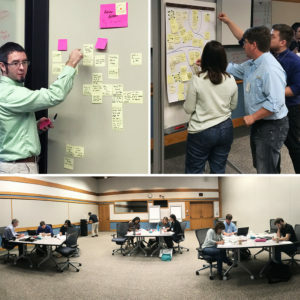 Purpose UX led a two-day workshop at CCL’s offices with key stakeholders to develop insights about how to improve the Compass experience. With those insights, we audited the existing app and identified the key usability issues. Then we overhauled the interface, designed new data displays, and integrated the goal-setting tool throughout the experience. In the initial design, there was no onboarding experience, so users did not have a clear path to get started. Goals were presented as their own section of the site, but had little relevance to users right away. Too many small features were given their own place in the left navigation, which conflicted with the top navigation tabs. The assessment data was presented as purely numerical, which was not engaging and made it hard to see patterns. On top of having to scan a table of dense numbers, when users expanded the table rows to see more detail, each subrow had different headings from the table itself. This made the assessment results confusing and difficult to parse. We designed a clear 3-step sequence for users to complete, and reduced the number of left navigation items from 8 to 3. We elevated upcoming action items to the main page instead of reserving them on their own page. We also designed a user-created reading list and highlights so users could bookmark content to read later. 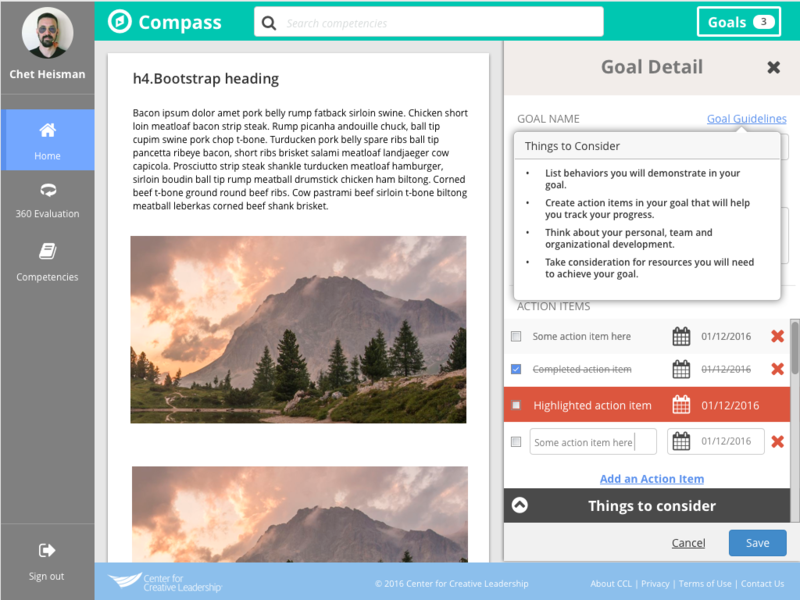 We moved the goal-setting off of the home page and placed it in a dynamic panel that can be accessed from the top navigation. We replaced the table with a bar graph that gave a more immediate picture of the assessment results. 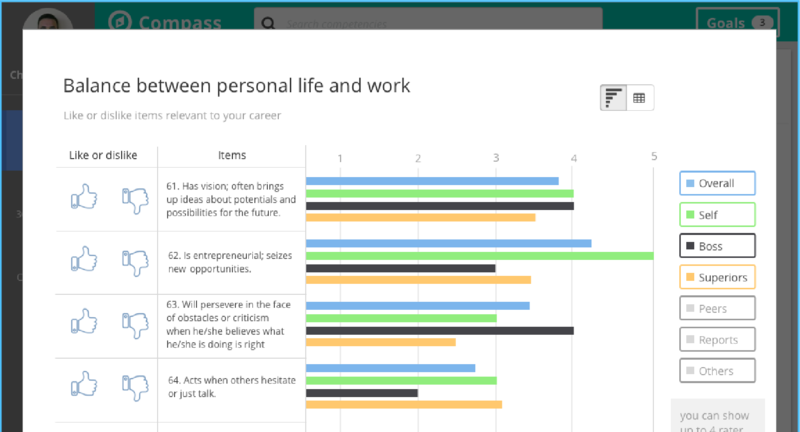 Filters and sort features allowed users to focus on the data that mattered most to them. 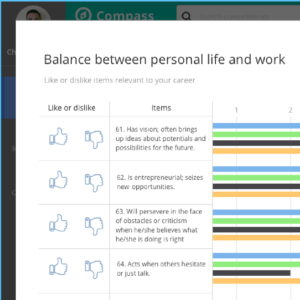 We also reduced the complexity of the data by moving the organization’s “importance” scores to a separate tab. 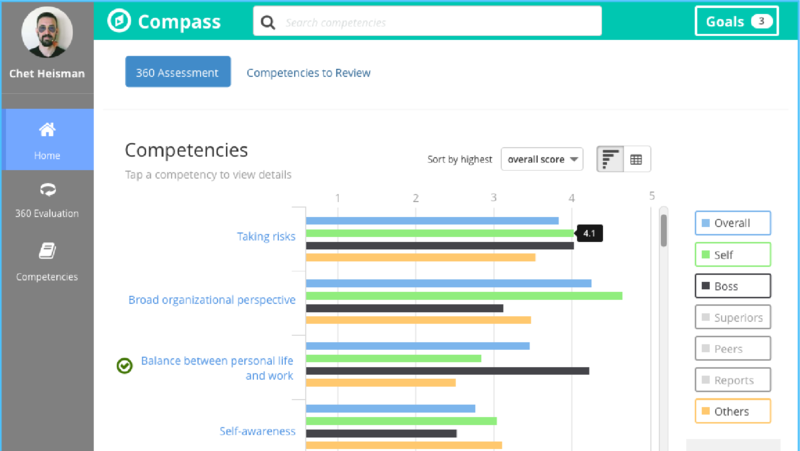 The initial design presented this alongside individual assessment results, but we found that people’s primary need was to see how they had been rated personally. Only after reviewing their own results were people receptive to looking at their organization’s priorities. Goal-setting was originally a five-step process that was separated from the other content in the app. Users were frustrated by the number of clicks and by the lack of context — they had to switch between the goal screen and the content screens to remind themselves of the right information as they went through the process. 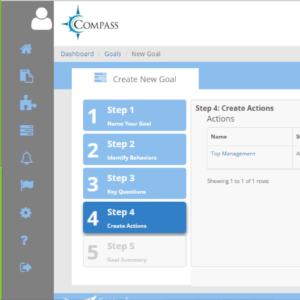 We integrated goals throughout the application with a dynamic panel. 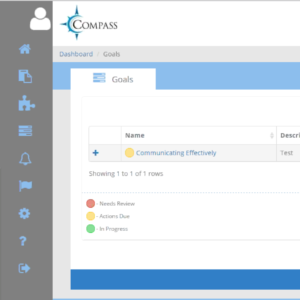 We also streamlined goal-setting to a single screen by removing little-used steps and consolidating input fields. 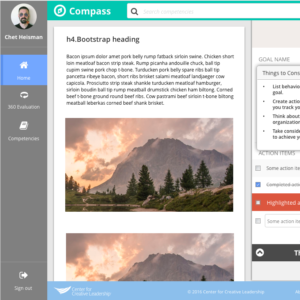 Users now can make goals while still looking at the CCL curriculum, their own assessment results, or their organization’s priorities. With an updated UI, an integrated goal setting tool, and dynamic visual data displays, the redesigned app won over internal stakeholders who were skeptical about using technology in the retreat setting. Initial reluctance on the part of CCL coaches and trainers was replaced by enthusiasm and requests to pilot the app. 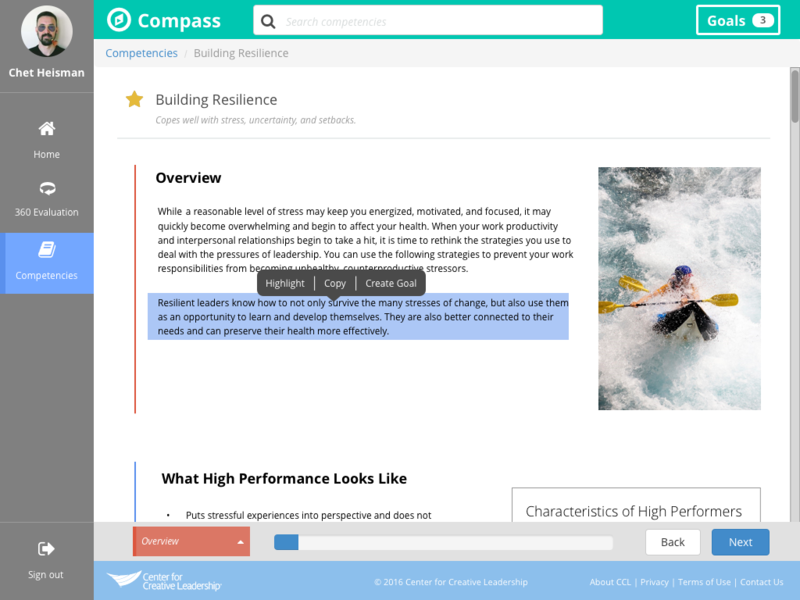 Once the pilot results were in, Compass became a key piece of the retreat experience, one that showcases CCL’s embrace of new technology solutions to issues in the traditional executive education classroom. 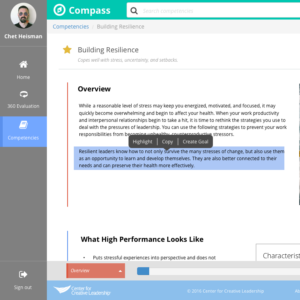 Compass’s success inspired a “Compass Next” project, an initiative aimed at modernizing the delivery of executive development. We were brought back in to help design that product as well, and look forward to its public release!